DJzone DJ Magazine :: YOU MAY NOW KISS THE DJ! YOU MAY NOW KISS THE DJ! 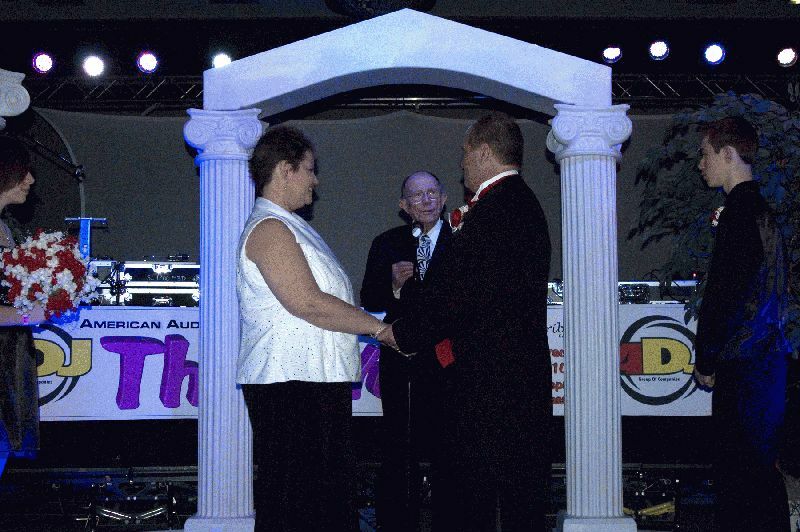 When Jimmie Hontz Jr. and Rachel Welch exchanged their vows before a minister on their very special wedding day on Wednesday, February 10th, their wedding was traditional in every way; there were flowers, a tiered wedding cake, champagne, a minister and about 500 DJs! Jimmie and Rachel, who are both DJs themselves, decided that the annual American DJ Customer Appreachiation Party would be the ideal locale for their special day, where they were sure to be in the company of people who share their passion for good music and good entertainment. The American DJ Customer Appreciation party, a signature event, has been held at the DJ show for nearly 10 years, and brings in around 500 guests. The couple, from Gardner, Kansas, chose this to be the venue for their not-so-ordinary nuptials. The top of the famed Las Vegas Riviera Hotel and Casino became the most romantic spot on the Vegas strip for the happy couple last Wednesday. Standing before a dreamy white altar, Rachel donned a sparkling white satin blouse and flowing black skirt, clutching a bouquet of roses as she exchanged vows with her future husband. Jimmie stood beside his bride and beamed with happiness in his dapper tuxedo and romantic red rose boutonnière. Two of the couple’s beloved children, Kaela and Shawn, were right alongside their parents to witness the event as the officiant led the unique ceremony. As per tradition, the pair cut their elegant cake in front of all their special guests and led a champagne toast as they began their happy new life together. Lucky for the new couple, transportation was not necessary to their reception, as they were standing right in the middle of it! The party started as soon as the knot was tied, and this year’s show featured the incomparable and captivating DJ Kool, who wowed the crowd and rocked the party. There was food, fun and friends, and those who were there to witness the celebration will certainly remember the joyful event for years to come. Scott Davies, General Manager of the Los Angeles-based company explains, “We appreciate our customers; they’re like family to us. We’re very happy to show our appreciation for Jimmie and Rachel by hosting their wedding.” The guests toasted to a once-in-a-lifetime wedding event, full of warm happy memories that will last the new family forever.